When’s the last time you downloaded a song off of iTunes? If you’re a millennial, then chances are, you had to think long and hard about the answer to that question. You probably spend more time on Pandora, Spotify, or some other streaming music service rather than sifting through iTunes trying to decide what song you want to own for the rest of your life. unlimited is what is en vogue today. Unlimited data plans, unlimited downloads, unlimited access to music. It’s great for the consumer, but over the past decade, we’ve seen record labels complain, file lawsuits, and complain some more about losing control over their industry. On the other hand however, we’ve also seen ticket sales for concerts skyrocket. For example, from 1999 to 2009, concert ticket sales in the US tripled from $1.5 billion to $4.6 billion. 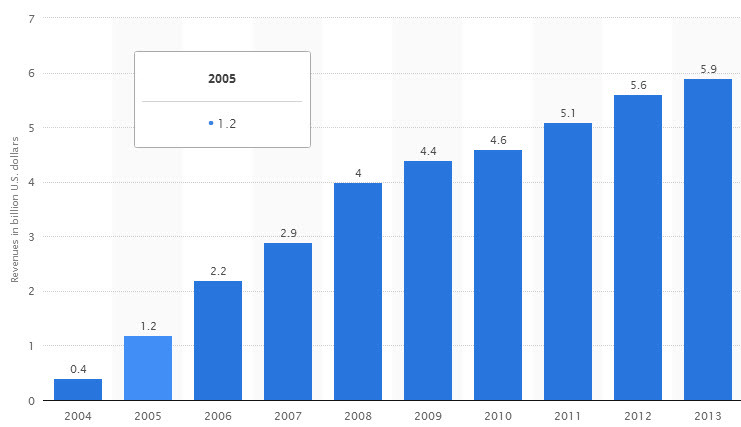 And from 2004 to 2013, revenues from digital music globally grew from $400M to $6B…that’s a 15 fold increase (see chart below). So has streaming been that bad for the music industry? Not really, one could argue. It’s better than illegally downloading music right? In fact, it seems like the only real losers in this process have been established artists. There’s an interesting article out today from the WSJ that brings to light just how much music labels are winning from music streaming, and how much some established artists are seemingly losing. Right now, record labels pay artists a fairly standard royalty rate on digital downloads and CD sales—generally between 10% and 20%, but there’s a growing debate around how much they should pay artists for streaming services. Some artists (the good negotiators, I think) are getting paid as much as 50% of streaming revenue, arguing that licensing their music to these services is more akin to placing it in a film or advertisement, in which case artists typically get half the fee. Earlier this month in Washington, where lawmakers are considering a broad overhaul of copyright law, indie label co-founder Darius Van Arman noted how significant breakage can be. Testifying at a music licensing hearing, Mr. Arman said that independent record companies were set to receive $1 million in breakage from two licensing deals. In one deal, he said, the breakage was more than half of what was earned in royalties, and in the second deal, the breakage was almost five times what was earned. Some artists signed to labels that claim to share breakage say they have never seen digital breakage show up on their income statements, though such an item could be easily missed, as the statement for a single work nowadays may tabulate hundreds of thousands of individual payments. We’ll have to keep an eye out to see how this goes, and whether this starts to play out in Washington (as it should). For all of the artists negotiating royalties now though, this is something you should definitely bring up.